We are the exclusive full line distributor for Movacolor in the U.S., Canada, and Mexico. We offer the complete line of volumetric and gravimetric Movacolor color and additive feeders including the MC18, MC30, MC-Balance and MC-Twin models. We offer the most advanced and universal additive feeders available on the market, and at any price. We can dose as little as a fraction of a gram per second to as much as several hundreds of kilograms per hour. We do this using a simple volumetric device that is controlled by speed and time or using a single-component gravimetric system that automatically adjusts itself to the required output rate… all with no calibration required! Determining the need for volumetric or gravimetric dosing. Evaluating your production process to determine if you need single or multi component dosing. The volumetric dosing process adds colorant by volume. As the volume of the colorant can change through many external factors, it is important to manually calibrate the unit regularly. The most basic units from Movacolor, including the MC-12 Economy and the MC-18 Synchronic, need to be manually calibrated. If manually calibrating each unit isn’t in your operating plan, you might consider an MC-30 Auto Calibrate. While this model is for volumetric dosing, it does offer optional gravimetric calibration. The unit can be equipped with a gravimetric calibration tool, allowing the user to automatically calibrate all volumetric MC-30 units in your factory. Or consider the MC-Liquid-V, which…. The gravimetric dosing process adds colorant by weight. Our gravimetric dosing unit, The Balance, continuously weighs the material, adjusting automatically to changing circumstances. The primary advantage of gravimetric dosing is that the operator doesn’t need to perform regular calibrations. This saves time and eliminates the danger of making costly calibration errors. As the premier unit in the Movacolor product line, the MC-Balance, utilizes gravimetric dosing. 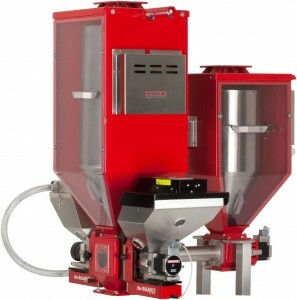 Movacolor also offers another gravimetric dosing system, the MC-High Output. The name speaks for itself and takes over where the Balance leaves off. The MC-High Output system has delivery rates as high as 1,000 kg/hour. We also offer the MC-Liquid-G…. Single vs. Multi-component Dosing – Single component dosing is suitable for all types of production processes. All Movacolor dosing units come standard as single component devices, but can be easily upgraded into a multi-component system. Multi-component dosing is the ideal solution for when you handle regrinds or extra components. The multi-component dosing unit is able to dose masterbatch as well as regrind at the same time in a closed loop. Movacolor offers completely gravimetric dosing systems for regrinds and color concentrates using the MC-Twin G.
The Balance is a single-component gravimetric dosing system in its simplest form. This system is super easy to operate — just enter the shot weight (or extrusion rate) and percent addition, then press START. The system will automatically adjust its output without any further interaction, leaving your machine operators to perform other important tasks. A single Balance can be combined with other Movacolor gravimetric dosing devices (including other Balances) in a multi-component configuration that is a cost-effective, accurate and user-friendly solution for all of your dosing needs. The MC-Touchscreen provides an E asy-To-Use graphical control terminal for all of the Movacolor gravimetric dosing devices … up to 15 total gravimetric systems using one single Touchscreen controller. The MC-Twin is a special-purpose gravimetric dosing system, designed specifically for dosing both color concentrate masterbatch and regrinds. This system will work for both injection molding and extrusion applications. With this unique approach, the exact color level is maintained by automatic adjustment of the color dosing rate inversely proportional to the amount of regrinds that are added to the system. The MC-Powder is a gravimetric dosing device for sticky and non free-flowing powders. The MC-Powder system is based on the highly accurate and successful MC-Balance and uses many of the same components. This system adds a special hopper with an agitator and twin rotating open spirals to keep sticky powders from bridging. Dosing rates are from 100 grams to 40 kg/hour. Inline gravimetric blending systems – In its simplest form, the MC-Weight is used for monitoring the real-time usage rate for extrusion systems. The “Weight Hopper” is available in three versions, and can monitor extrusion rates up to 1,000 kg/hour (2,220 lbs/hour). This device also forms the heart of a continuous blender system. The extrusion rate of main material as it flows through the MC-Weight is communicated to as many as 14 additional systems … this includes the MC-Balance, MC-High Output, MC-Liquid and MC-Powder gravimetric dosing systems. Each dosing system is automatically adjusted as the flow of main material changes through the MC-Weight. Inline gravimetric liquid dosing. The MC-Liquid is also based on the same basic design as the MC-Balance and can be used for both extrusion and injection molding applications. Various pump types are available to meet the needs of the application, including peristaltic pumps and positive displacement pump mechanisms. Movacolor offers various volumetric dosing options for injection molding and extrusion applications. These systems utilize the same basic mechanical components as their gravimetric systems … hoppers, dosing devices, stepper motors, etc. Output is controlled by adjusting the speed of the dosing device and still offers good accuracy and consistency, but at a lower price point. Experience the ROMAX difference with the top customer support in the industry.